What happens when you as a small micro-brand want to make the ultimate dive watch? The first step is, how do you define ‘ultimate’? Orange Watch Company (OWC) makes their vision a reality by optimizing each part for its job. What’s that even mean? For OWC, it means obsessively picking the best part for the job, even if it means bucking tradition. Spring bars are weak, lousy, and prone to failure under strain. They’re annoying to remove and insert. What do they get replaced with? Torx head screws. The bezel and crown are meant to have grip for turning. On other watches, you tend to get coin edge or scalloped finishing, because that’s what Rolex, Tudor, and Omega do. Here on the 6538 model, for maximum grip, OWC uses an even diamond knurled pattern. For their Snowflake model, they do pay homage to tradition and use the coin edge crown and scalloped bezel as most dive watches do. 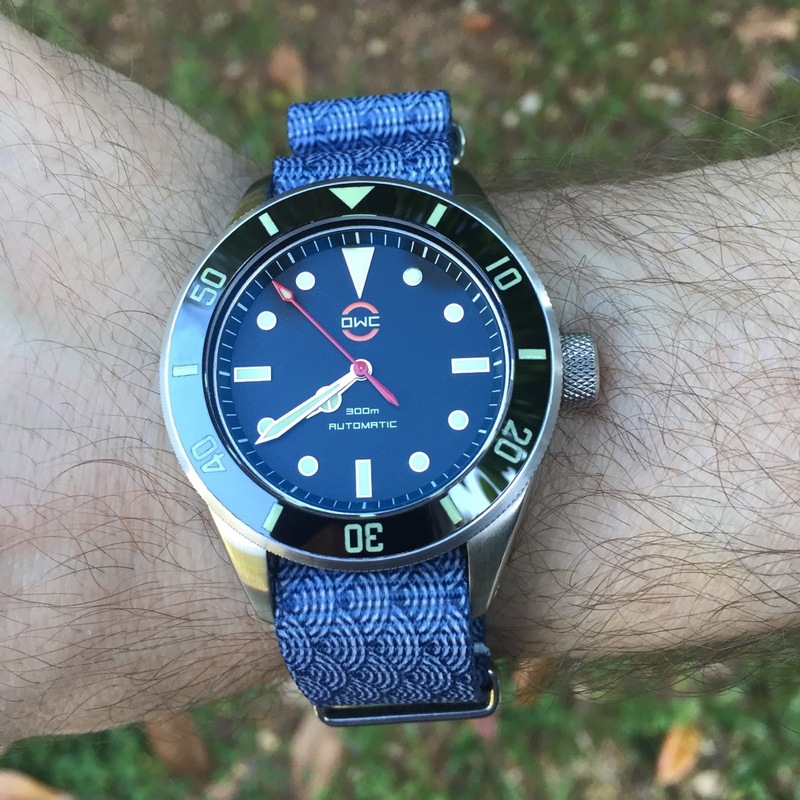 The bracelet is high quality, and rather than use pins or tiny flathead screws that strip to attach just a few adjustable links, again, OWC goes a little nuts. Every link is removable with Torx head screws. The bracelet is non-tapering, which is a shame; personally, I prefer the comfort of a bracelet that tapers to a narrower clasp. The strap is made from 100% kangaroo leather. It’s some of the softest, most supple, leather we’ve ever had the pleasure to wear. You see, so far, how every part that’s acceptable in traditional dive watches is replaced with a part that can either take more abuse, or is higher specification? That means we have to talk about the movement. This is a point that tends to enrage watch purists, because there’s the feeling that somehow, a Swiss watch that’s been blessed by being made where watchsmiths purify themselves in the waters of Lake Neuchatel is intrinsically better. While there is no doubt that Swiss craftsmanship is excellent, and that historically, Switzerland has been a center for watchmaking, we shouldn’t overlook the influence of the rest of the world: Remember that the Swiss came to the US in the heyday of American watchmaking to learn from the likes of Hamilton and Elgin. It’s also worth remembering that the Swiss canceled the Swiss Chronometry contests in the 1960s, when Seiko started entering and winning.. Knowing that, it should come as no surprise that Chinese movement production exists in sort of a quantum state: there are some very poor quality movements, some very good movements (especially after QC testing), and people who are fans of the Swiss reputation that feel threatened or offended by their use. But when you’re choosing the movement based on performance as opposed to country of origin, it makes sense to explore the Chinese offerings and use a Seagull that follows the ETA 2892-A2 design. Provided it’s been checked for quality and performs properly, it turns out to be an excellent movement, especially for running a superior dive watch. However, due to the un-deserved reputation of Chinese movements, OWC now uses the Swiss Soprod A-10 (similar to the 2892) entirely. (The ‘Movements’ page makes a lone reference to the Seagull, “ETA 2892-A2 clone – Seagull ST-1812 – Now deleted.”) The point is, the single-minded focus is on choosing superior parts based on their performance, not their country of origin alone, whether it’s the case design, or the movement. Speaking of case design, OWC’s cases are true compressors. The function of a compressor case is that the case back isn’t tightened fully against a rubber seal to form the water-resistance needed for depth. Instead, the caseback tightens against the case as the pressure increases with greater depths. It is inspired by the cases made by EPSA in the 1960s, but doesn’t have the two crowns associated with compressor watches. Instead, the watch is equipped with the screw-down crown, a crystal retaining ring, top and bottom O-rings (many watches use just a bottom O-ring), all of which contribute to the water resistance under pressure. I had the chance, courtesy of a good friend, to borrow the OWC 6538 BOND model for an extended period of time. A few years ago, every microbrand was making their homage to the 6538 Rolex, the Submariner that Sean Connery wore in his turn as 007. The 6538 Rolex Submariner is characterized by being a tool watch more than the jewelry that later Submariners became. There are no crown guards. The crown is hugely oversized even by today’s standards. It’s an 8mm crown, where the common thing on watches of that time period was 4 or 5mm. The big crown looks even bigger mounted on the 38mm Submariner, as opposed to later 40mm models. The OWC 6538 uses the modern 40mm size, gives it the same large 8mm crown without crown guards, but changes the knurling to a diamond hatching. The original Rolex used a wide coin edge on the bezel and crown, and here, the bezel uses the same diamond knurling. The bezel action is grippy, and precise. The dial is a matte black, and the sapphire crystal is double AR coated. This means that instead of seeing the sun reflecting on the crystal, you see the dial itself. It’s fantastic, and looking it at is like looking at a watch that doesn’t have a crystal on it. Again, if the purpose is time-telling, this is the best way to do it. That’s really what this amounts to: The Orange Watch Company starts with a singular vision of the end goal, makes every part optimized for its best performance, and that’s the watch. It’s a watch where there are as few compromises as possible, and the few that are present are in the name of making the watch perform better. Price: pricing starts at around $1385 USD. Depending on options, you’d best inquire with OWC. Who we think it might be for: You like a classically inspired tool watch with no compromises. If I could make one design suggestion, it would be: I want to make a hybrid model, MS-6538 dial in MS-9411 case, without the crown-guards. But we don’t always get what we want. All of the offerings OWC makes are cool. Previous articleWMT Walter Mitt custom watches: I like this.